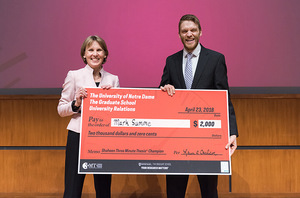 Mark Summe, a Ph.D. student from the Department of Chemical and Biomolecular Engineering, won the 2018 Notre Dame Graduate School Shaheen Three Minute Thesis Competition (3MT®) on Monday night in Jordan Auditorium. 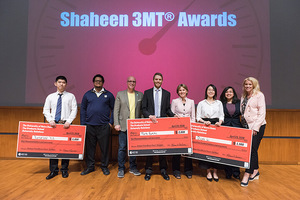 The Shaheen 3MT® is a communication competition where graduate students from the Colleges of Engineering, Science and Arts & Letters try to effectively explain their research in a language appropriate to an audience of specialists and non-specialists alike, in three minutes or less. Competitors addressed a panel of judges in front of a live audience using a single static slide to support their presentation. A well-crafted 3MT® presentation may contain some of the same elements as a stirring dramatic monologue with equal parts emotional and intellectual intensity. A great one may even include touches of comedy. As in its theatrical counterpart, a 3MT® presentation should command rapt attention from an audience. Along with the conviction and poise of its presenter, it will also succeed in setting a scene and revealing its passions. Summe bested the other eight finalists for a top prize of $2000. 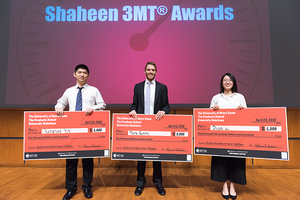 A second place prize of $1500 went to Diya Li (CBE) and $1000 to the People’s Choice winner, Xunzhao Yin (CSE). Other finalists who competed on Monday were Matteo Bianchetti (PHIL), Elvin Morales (BIOS), Jonathan Gondalman (POLS), Whitney Liske (MATH), and Sarah Lum (CHEM). Summe’s presentation, titled “Drinking Water From A Printer?,” told the troubling story of the world’s current water supply, where less than one percent of one percent is safe to drink and even much of that is contaminated with parasites, lead, and pharmaceutical waste. 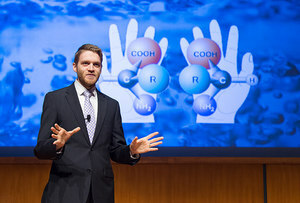 Summe designs membranes that essentially act like magnets in extracting salt and heavy metals from water. Amazingly, these membranes can be generated by your average inkjet printer by substituting more functional polymers for inks and alternate porous supports for paper. The production of drugs can also generate dangerous and harmful molecules. Summe’s work looks to use these membranes to separate these harmful molecules so that they do not cause damage such as blindness, for example, during treatments, but also so that they do not further pollute that already limited water supply. Originally published by Aaron Bell at graduateschool.nd.edu on April 25, 2018.